Alphacool’s answer to the often difficult situation of being unable to mount the heatsink conventionally. With this double-sided thermal adhesive pad from Alphacool it is possible to mount a heatsink at any desired spot without having to worry about mounts, hole spacing or other constructive details. This is especially interesting for systems such as Alphacool’s MCX system to allow mounting of heatsinks for graphics cards or Mainboards. But long-term testing shows that these pads are capable of much more than just holding small heatsinks! A holding power of at least 16N/25mm means an adhesive force greater than with some duct tapes! This allows mounting even of heavy coolers and the capability to deal with shocks from transport or twisting/ permanent pressure. The pads are covered with a protective foil on both sides when shipped. When this foil is pulled off, the white pad becomes visible. 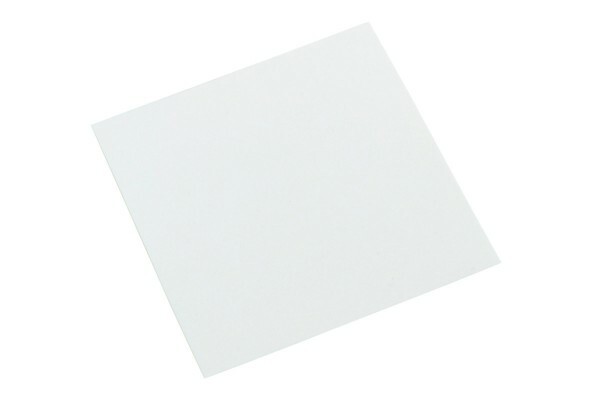 The pad feels very similar to rubber, and has the same advantages: It adapts to the surfaces easily, hence allowing the best possible heat transfer. Multiple pre-cut dimensions make cutting almost obsolete, but should it be needed to adjust the size of a pad, simply use scissors or a knife! Lassen sich die Pads auch wieder entfernen? Generell lasen sich alle Wärmeleitpads die selbstklebend sind relativ einfach wieder abziehen. Die Klebeleistung ist nicht zu vergleichen mit Wärmeleitkleber, allerdings reicht sie um kleine Kühlkörper sicher am Platz zu halten.